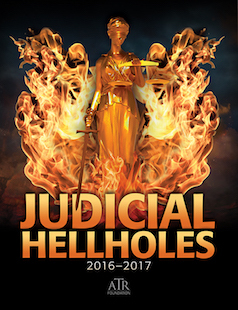 The 2016-2017 Judicial Hellholes report shines its brightest spotlight on nine courts or areas of the country that have developed reputations as Judicial Hellholes. #1 CITY OF ST. LOUIS, MISSOURI. The City of St. Louis is a magnet for product liability lawsuits and consumer class actions. The local trial court hosted three gigantic verdicts this year, totaling $197 million, in cases asserting that talcum powder causes ovarian cancer, plus other multimillion-dollar awards. The recipients of these awards, and most of the individuals filing these types of lawsuits, are not from St. Louis, or even Missouri. They travel from across the country to sue in St. Louis. Why? The state’s weak venue law and a lenient standard for expert testimony that allows “junk science”. Plaintiffs’ law firms have tainted the jury pool by inundating St. Louis residents with constant television advertising. #2 CALIFORNIA. The Golden State is indeed that for personal injury lawyers seeking riches at the expense of employers, consumers and taxpayers. Lawmakers, prosecutors and judges have long aided and abetted this massive redistribution of wealth. By enacting more than 800 new laws every year, legislators and the governor make it all but impossible for California residents and businesses to stay current and thus avoid being targeted by the nearly 1 million new lawsuits filed there annually. And when the state’s highest court effectively invites out-of-state plaintiffs to sue out-of-state defendants over alleged out-of-state injuries in California courts at state taxpayers’ expense, no one can be surprised that often preposterous lawsuits over workplace rules, pay-stub formatting, food and beverage labels, imaginary environmental hazards, disability access and novel public nuisance theories proliferate and act inexorably to expand civil liability. #3 NEW YORK CITY ASBESTOS LITIGATION. The conviction of New York Assembly Speaker Sheldon Silver, who moonlighted at an asbestos law firm, and the replacement of Judge Sherry Klein Heitler, who was known to give “red-carpet treatment” to the plaintiffs’ bar should have begun the process of restoring fairness to the Big Apple’s asbestos court. It hasn’t. Defendants are presumed guilty unless proven innocent. They face liability beyond their level of responsibility. And judges combine multiple lawsuits into a single trial, blending evidence, confusing jurors, and driving up awards. Parties await a new case management order, but defendants expect the worst, including the reintroduction of punitive damages long sought by plaintiffs’ lawyers. #4 FLORIDA SUPREME COURT AND SOUTH FLORIDA. The Sunshine State’s highest court continues a long record of liability-expanding rulings and decisions that rewrite and invalidate laws that do not fit the policy preferences of a majority of the court’s members. This year’s decisions increase workers’ compensation costs and subject to new liability employers, state agencies and even those who call police for help. South Florida, in particular, is known for its aggressive personal injury and consumer litigation bar and troubling alliances between lawyers, shady medical clinics, and service providers that run up expenses for lawsuits. #5 NEW JERSEY. The Garden State’s high court has declared war on the use of arbitration as an alternative to lawsuits and issued liability-expanding rulings. While Atlantic County is no longer the draw it once was for product liability claims, the state’s lax standard for expert testimony still leads plaintiffs’ lawyers to bring many drug and medical device cases there on behalf of people from other states. In addition, the state’s vague and complicated consumer protection laws have set off a feeding frenzy for plaintiffs’ lawyers. #6 COOK, MADISON AND ST. CLAIR COUNTIES, ILLINOIS. These three Illinois counties have long been go-to places for filing lawsuits. Whether it is medical malpractice, product liability or disability access lawsuits, Chicago is the wrong place to defend a case. Meanwhile, largely rural Madison County still serves as the nation’s epicenter for asbestos lawsuits. That it is the place of choice for plaintiffs’ firms is unsurprising given the close relationship between the judiciary and local lawyers, and a deck that is stacked against defendants. Its troublesome neighbor St. Clair County also hosts more than its fair share of litigation. Its judges have manipulated the judicial selection system to remain on the bench. The state’s expansive liability laws and the influence wealthy plaintiffs’ lawyers exert on state politics further concern defendants. #7 LOUISIANA. Louisiana has a reputation for plaintiff-friendly venue laws, permissive judges, double-dipping asbestos lawsuits and trust claims, the highest jury threshold in the nation, abuse of consumer protection laws and excessive jury verdicts. But it is the governor’s attempt to hire campaign contributors to run multibillion-billion coastal erosion litigation against the state’s key energy industry that ensured the Pelican State’s ranking among Judicial Hellholes this year. #8 NEWPORT NEWS, VIRGINIA. This shipbuilding town stands out in a state that is otherwise viewed as having a balanced litigation climate. The court’s plaintiff-win rate in asbestos cases is the highest of any jurisdiction in the U.S., thanks to broad interpretations of maritime law and one-sided evidentiary rulings that make it difficult to mount a defense. #9 HIDALGO COUNTY, TEXAS. It’s hailing lawsuits in this agricultural county along the Rio Grande, as plaintiffs’ lawyers file thousands of lawsuits accusing insurers of not paying up for storm damage. As a result, insurers are leaving and premiums are climbing. Judges are wising up to the game and beginning to call out lawyers for bringing groundless cases, and lawmakers are poised to enact much-needed reforms. Beyond the Judicial Hellholes, this report calls attention to eight additional jurisdictions that bear watching due to their histories of abusive litigation or troubling developments. Watch List jurisdictions fall on the cusp – they may drop into the Hellholes abyss or rise to the promise of Equal Justice Under Law. GEORGIA SUPREME COURT. Georgia’s motto, “Wisdom, Justice, and Moderation” may need some editing. After several liability-expanding decisions last year, the state’s high court was back at it this year, allowing duplicative damages in nuisance lawsuits, issuing a blow to arbitration, and encouraging forum shopping. Well-reasoned decisions in cases involving damages when a pet is injured and asbestos liability keep the court off the Hellholes list. MCLEAN COUNTY, ILLINOIS. Bloomington has a history of lopsided rulings and resultantly questionable verdicts for asbestos plaintiffs that are frequently reversed on appeal. MONTANA SUPREME COURT. The Montana Supreme Court is known for its record of activism, lack of adherence to precedent, and defiance of the Supreme Court of the United States. This year the court thumbed its nose at the SCOTUS by finding its courts could hear a case brought by out-of-state railroad workers injured outside Montana against a business that was not incorporated or headquartered in the state. After excessive awards, defendants are also on edge about whether the high court will uphold a state law that reasonably constrains punitive damages. NORTHERN DISTRICT OF TEXAS. In 2015 this federal district court presided over the largest False Claims Act judgment in history. It gave an encore performance in 2016 with “unusual” evidentiary rulings in multidistrict litigation bellwether case that produced a $498 million verdict and a $1.04 billion verdict against a medical device manufacturer. This court is keeping the Fifth Circuit Court of Appeals very busy. PENNSYLVANIA SUPREME COURT. The Commonwealth’s high court has gone through a series of turbulent scandals, judicial resignations and a flip in the composition of the court. There is great uncertainty as to whether the new court will take a balanced and sound approach to deciding liability issues or begin catering to Philadelphia’s personal injury bar. Two appeals before the court may point the way to its future course. PHILADELPHIA COURT OF COMMON PLEAS. 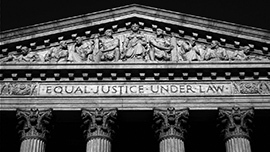 A recovering Judicial Hellhole, Philadelphia has significantly improved its litigation environment but continues to serve as a national hub for mass tort litigation. While only a few years ago 9 out of 10 pharmaceutical cases filed in the City of Brotherly Love came from other states, that proportion is now down to 65%. Still, when a case goes to trial, it often results in a whopper of a verdict. A recent rewrite of the jury instructions for product liability claims may further tilt the scales for the plaintiffs’ bar. PITTSBURGH (ALLEGHENY COUNTY), PENNSYLVANIA. The Allegheny County courthouse has developed a reputation for rulings that favor plaintiffs in asbestos cases. For instance, after one judge issued a ruling that would have limited the defendant’s damages, the case was reassigned to a second judge who subjected the defendant to expansive liability. In addition, Pittsburgh’s federal court has a spike in extortionate lawsuits against businesses of all sizes alleging that they have not provided the vision-impaired with sufficient access to their websites. WEST VIRGINIA. This once perennial Judicial Hellhole has made significant progress in restoring balance to its civil justice system over the past two years. On the heels of major reforms in 2015, the legislature took several more positive steps in 2016. Voters also elected a moderate to their state high court and reelected their reform-minded attorney general. Still, after decades of trial-lawyer control over Mountain State courts and policymakers, the formidable task of undoing the damage isn’t quite complete. Dishonorable Mentions, which annually highlight singularly unsound court decisions, go this year to the high courts of Arkansas, Indiana, and Maryland. This report also enthusiastically emphasizes the good news from some of the Judicial Hellholes and other jurisdictions across the country. Points of Light are examples of, among other things, fair and balanced judicial decisions that adhere to the rule of law and respect the policy-making authority of the legislative and executive branches. This year’s highlights include positive court rulings from eleven states. These courts made it easier to dismiss groundless claims, tougher to bring junk science into court, gave juries a more accurate understanding of how injuries occurred in auto accident cases, and reduced the potential for inflated damage awards. Courts also confirmed that a state attorney general can dismiss meritless cases brought on behalf of the state, but can’t hand the state’s law enforcement power to private contingency fee lawyers. In addition to these significant court rulings, legislatures in a five states enacted significant, positive civil justice reforms. This section of the report examines litigation under the federal False Claims Act’s “qui tam” provision, which allows private individuals to sue on behalf of the federal government and obtain a “bounty” if successful. As a result of a series of legislative expansions and judicial rulings, this law, originally enacted to battle fraud in contracting during wartime, has morphed into a plaintiffs’ lawyers dream. While the penalties available under the Act have increased, the requirements for bringing qui tam lawsuits have become significantly more lenient. Enticed by a promise of additional federal funds, states have enacted similarly problematic laws. And a recent U.S. Supreme Court decision, upholding an award for a whistleblower who flagrantly violated the law’s 60-day seal requirement, will likely encourage more questionable claims. But an appeal pending before the U.S. Court of Appeals for the Fifth Circuit could yet begin to move “Lincoln’s Law” back toward its original, commonsense purpose.